40 | TH E M R EP O RT O R I G I NAT I O N S E R V I C I N G DATA G O V E R N M E N T S E C O N DA R Y M A R K E T ORIGINATION THE LATEST Nonbanks Taking Over Originations With nonbanks dominating the market, experts say the lower level of regulation for these entities could put government agencies at risk. D ata released in Septem- ber from the Urban Institute revealed that nonbanks originated 60 percent of new mortgages this year. With nonbanks currently dominating originations, there are important facts policymakers need to consider, according to the Urban Institute. In 2013, banks originated 70 percent of mortgages, according to Urban Institute's data. However, the roles are reversed with nonbanks now originating 60 percent of new mortgages. Nonbanks originated 58 percent of purchase mortgages so far in 2017, compared to 63 percent of refinance mortgages. Another notable update for policymakers is that when it comes to FICO scores, the information revealed that the median FICO score for nonbank originations has "consistently been less than the median FICO score for bank origi - nations for all three agencies." In addition, the Urban Institute report revealed that increased reliance on nonbanks may pose in - creased risk to the GSEs and FHA, as "nonbanks are not as stringently regulated as banks, which may pose greater counterparty risk to the agencies, particularly Ginnie Mae." Finally, policymakers should take into consideration that banks have pulled back from GSE and FHA lending, according to the Institute. 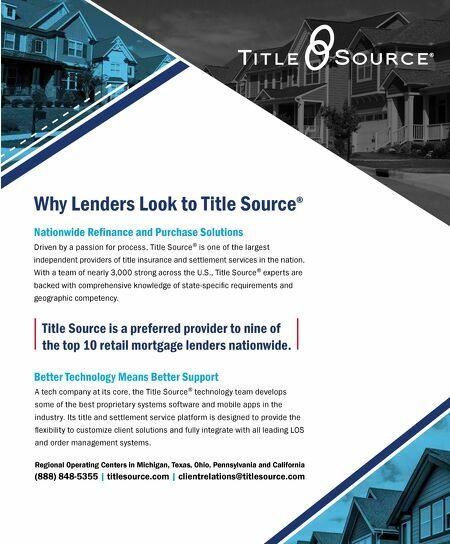 According to the data, the reasons include, "lack of clarity with loan investors, high cost of servicing delinquent loans, and uncertain litigation risks." 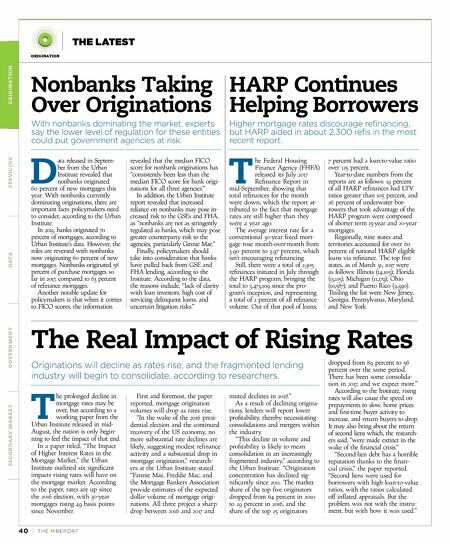 HARP Continues Helping Borrowers Higher mortgage rates discourage refinancing, but HARP aided in about 2,300 refis in the most recent report. T he Federal Housing Finance Agency (FHFA) released its July 2017 Refinance Report in mid-September, showing that total refinances for the month were down, which the report at - tributed to the fact that mortgage rates are still higher than they were a year ago. The average interest rate for a conventional 30-year fixed mort - gage rose month-over-month from 3.90 percent to 3.97 percent, which isn't encouraging refinancing. Still, there were a total of 2,305 refinances initiated in July through the HARP program, bringing the total to 3,473,109 since the pro - gram's inception, and representing a total of 2 percent of all refinance volume. Out of that pool of loans, 7 percent had a loan-to-value ratio over 125 percent. Year-to-date numbers from the reports are as follows: 19 percent of all HARP refinances had LTV ratios greater than 105 percent, and 26 percent of underwater bor - rowers that took advantage of the HARP program were composed of shorter term 15-year and 20-year mortgages. Regionally, nine states and territories accounted for over 60 percent of national HARP eligible loans via refinance. The top five states, as of March 31, 2017 were as follows: Illinois (14,105); Florida (13,115); Michigan (11,179); Ohio (10,587); and Puerto Rico (9,390). Trailing the list were New Jersey, Georgia, Pennsylvania, Maryland, and New York. The Real Impact of Rising Rates Originations will decline as rates rise, and the fragmented lending industry will begin to consolidate, according to researchers. T he prolonged decline in mortgage rates may be over, but according to a working paper from the Urban Institute released in mid- August, the nation is only begin- ning to feel the impact of that end. In a paper titled, "The Impact of Higher Interest Rates in the Mortgage Market," the Urban Institute outlined six significant impacts rising rates will have on the mortgage market. According to the paper, rates are up since the 2016 election, with 30-year mortgages rising 49 basis points since November. First and foremost, the paper reported, mortgage origination volumes will drop as rates rise. "In the wake of the 2016 presi - dential election and the continued recovery of the US economy, no more substantial rate declines are likely, suggesting modest refinance activity and a substantial drop in mortgage origination," research- ers at the Urban Institute stated. "Fannie Mae, Freddie Mac, and the Mortgage Bankers Association provide estimates of the expected dollar volume of mortgage origi- nations. All three project a sharp drop between 2016 and 2017 and muted declines in 2018." As a result of declining origina- tions, lenders will report lower profitability, thereby necessitating consolidations and mergers within the industry. "This decline in volume and profitability is likely to mean consolidation in an increasingly fragmented industry," according to the Urban Institute. "Origination concentration has declined sig- nificantly since 2011. The market share of the top five originators dropped from 64 percent in 2010 to 29 percent in 2016, and the share of the top 25 originators dropped from 89 percent to 56 percent over the same period. There has been some consolida- tion in 2017, and we expect more." According to the Institute, rising rates will also cause the speed on prepayments to slow, home prices and first-time buyer activity to increase, and return buyers to drop. It may also bring about the return of second liens which, the research - ers said, "were made extinct in the wake of the financial crisis." "Second-lien debt has a horrible reputation thanks to the finan- cial crisis," the paper reported. "Second liens were used for borrowers with high loan-to-value ratios, with the ratios calculated off inflated appraisals. But the problem was not with the instru - ment, but with how it was used."